Why buy my newest e-cookbook? Because it is full of comfort foods and also decorative dishes that would make your celebrations a memorable, tasty event. Some of them are fit for a King or for the Queen of your heart. Welcome to my latest e-cookbook, which I dedicate to one of my favorite seasons, Fall. O.K. I must be honest, I have sneaked in some recipes that you will simply love during blistery winter days as well. As you know I live in Canada but my heritage is Hungarian, so you will find dozens of time tested recipes from the tables of my Grandmother and Great-Grandmother. As always, I aimed to create a cookbook that will include all parts of cooking. Soups and main dishes are a must in my family that all well rounded meals would include. 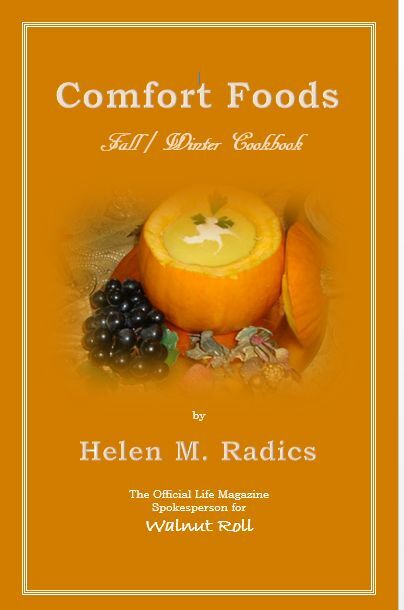 You will find mouth-watering diet soups, rustic soups, elegant gourmet soups, holiday dishes and peasant recipes that will be guaranteed family favorites warming up your heart and soul. • Wine Lover's Grape Soup 2.